For auto glass replacement and installation services, let The Glassman come to you for windshield repair or auto glass services for all other windows of your car or truck. These services are offered for all makes and models of vehicles, and we gladly work with all major insurance companies. The Glassman is Southeastern Massachusetts and Rhode Island's local expert on mobile auto glass repair and windshield replacement. For top quality on-site auto glass services, The Glassman is the one you need to call. We can come to your location in Bristol County, MA including the cities of Fall River, New Bedford, Westport & Dartmouth to name a few. The Glassman's mobile services also extend to the entire state of Rhode Island including the cities of Providence, Pawtucket, Warwick, Wakefield, Woonsocket, and every other city in The Ocean State. 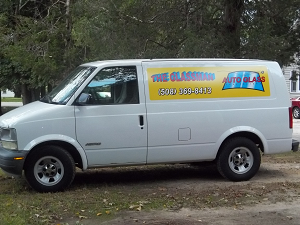 The Glassman always delivers high quality auto glass products and high quality mobile service!